On Tuesday, March 1, Georgians will have the opportunity to vote in the Presidential Preference Primary that will help choose the next President of the United States. 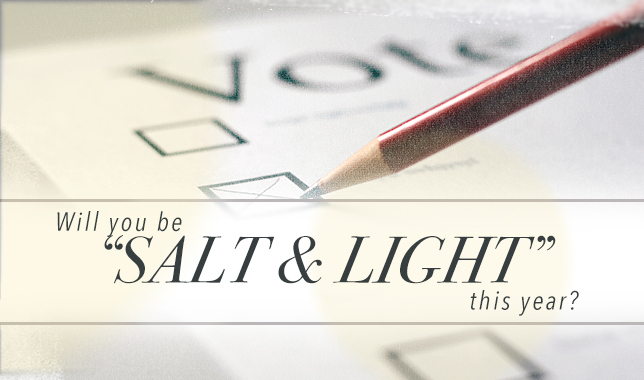 Followers of Christ should be “salt” and “light” – see Jesus’ teaching in the Sermon on the Mount (Matthew 5:13-16) – by actually going to the polls and casting our ballots. I encourage you not to sit it out. Get out of the salt shaker. Let your light shine. Vote! Did you notice the two key components? “Integrity of heart,” that’s character. “Skillful hands,” that’s competence. It’s unwise to ignore either of these essential factors of good leadership. But how do you know whether a candidate has character and competence? Again, Scripture is helpful. Though we are electing a “commander in chief” not a “pastor in chief,” some of the principles outlined in 1 Timothy 3 are transferable to virtually any leadership selection process. “The husband of one wife.” The character of a leader is shaped and revealed in the crucible of everyday living – especially in marriage and family life. Is there a track record of fidelity? Is he a promise-keeper? Is there evidence he knows how to “manage his own household well”? What about his parenting and his children? As you evaluate the candidates, consider carefully what their life-long, personal patterns reveal. “Sober-minded, self-controlled, respectable.” These are traits essential to wise leadership. “A fool gives full vent to his anger,” the Bible says, “but a wise man keeps himself under control” (Proverbs 29:11, NIV84). “He who guards his lips guards his life,” says God’s word, “but he who speaks rashly will come to ruin” (Proverbs 13:3, NIV 84). As you evaluate the candidates, consider carefully what their words reveal about their character. “Not a recent convert.” Of course, no candidate is perfect, and, by God’s grace, it’s possible for a person to repent, to grow, and to change – in his values, his views, and his patterns of life. Conversion is at the heart of the gospel, and we should celebrate every time someone turns to the truth. However, it’s risky and dangerous to put a new convert in the first-chair leadership seat in any organization. As you evaluate the candidates, consider carefully how long they have espoused their current values and views. Not “puffed up with conceit.” Scripture is not ambiguous here. “Pride goes before destruction,” the ancient wisdom writer says, “and a haughty spirit before a fall” (Proverbs 16:18, ESV). “God opposes the proud,” the Bible says, “but gives grace to the humble” (James 4:6, ESV). Virtually all the candidates are strong people with some level of achievement and accomplishment. As you evaluate the candidates, do you also see evidence of genuine humility? “Well thought of by outsiders.” Of necessity, the leader of a group must relate not only to “insiders” (those constituents in his church, business, school, nation, etc. ), but also to “outsiders.” Over time the leader becomes the most recognizable and influential face and voice of the group. As you evaluate the candidates, consider carefully how effectively they will represent us to the larger world. When we turn to Scripture, we do not find a specific directive telling us who we should vote for in any given election. However, as you see from 1 Timothy, there are applicable biblical principles about choosing leaders that we ignore at our peril. Perhaps they will help you narrow the field. Ask God for wisdom, and on Tuesday take your biblical values with you to the polling place . . . and vote!